Sorry about getting this up so late, I was on vacation for much of last week. I suspect that there will be one or two people out there who will, for some reason, bemoan the lack of action scenes in this issue (yeah, I don’t get what’s wrong with them either). I, for one, dug the heck out of Antony Johnston’s solo effort Shadowland: After the Fall. It captured the same sense of grounded realism that Daredevil fans had come to expect prior to the detour of the last few months, and in doing so helped anchor Shadowland and normalize (for lack of a better word) its implications. 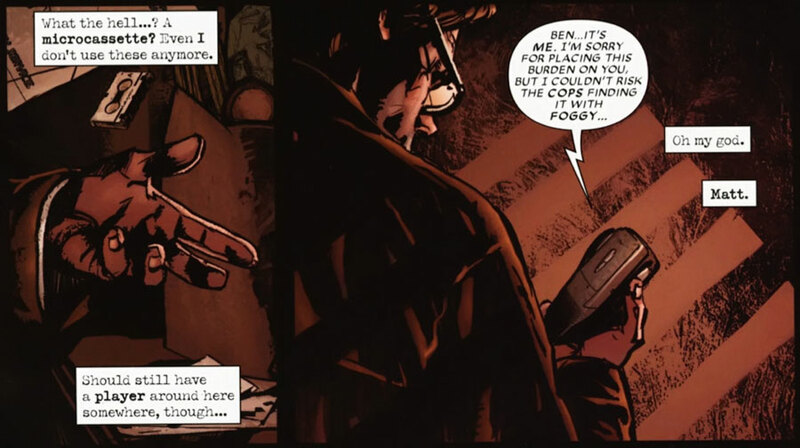 The issue has two main narrators in longtime Daredevil supporting character Ben Urich and the more recent addition Detective Alex Kurtz. 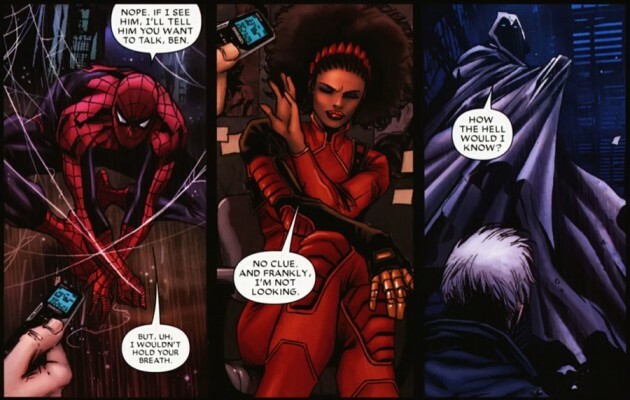 They are both trying to get to the truth of what happened and find Matt Murdock, Kurtz in his role as a police detective given the task of bringing him to justice, and Urich as the reporter who is also a longtime friend of the subject of his inquiry. During the course of their respective investigations, they come into contact with some of Daredevil’s costumed former allies (see below, I particularly like Moon Knight’s comment), as well as Foggy Nelson and each other, a confrontation that ignites quite a few sparks. More interestingly, Ben Urich also recevies a message from none other than Matt Murdock himself who features prominently in this issue, though entirely off-panel and in voice only. Having Matt tell at least parts of his story helps bring closure to the Shadowland story and provide some background for next month’s Daredevil: Reborn. Throughout this issue, Johnston displays great attention to detail in everything from dialogue to the handling of the various perspectives of all the different characters. I just really like the “sound” of the characters’ voices and After the Fall comes off as a very well-written issue. One detail (albeit a minor one) I appreciated was Matt sending Ben a microcassette. Outdated as the may seem, as Urich himself points out, microcassette recorders are still fairly commonly used by the blind. Whether this is an instance of good research on Johnston’s part or just a good hunch, I like the authenticity. I’m not sure whether I think Matt’s recorded monologue really succeeds in explaining much of what happened during the madness of Shadowland, as far as his own actions go, but I think that may be asking too much. Shadowland will likely continue to be regarded as a very controversial storyline and nothing that can be said after the fact will change that. In this regard, I think the inclusion of Elektra toward the end of this issue does more to explain what has happened to Matt, and her presence is used to great effect in this story, highlighted by the beautiful artwork. In drawing a parallel between herself and her former lover we get a sense of the permanent(?) damage the events of the last few months have done to Matt’s psyche. As has often been the case for much of this run, the art duties are shared between Roberto de la Torre and Marco Checchetto. Their two styles are similar, but easily recognizable (though not to the extent that it comes across as too jarring). Regular Daredevil colorist Matt Hollingsworth will return for Daredevil: Reborn, but was not available to color this issue, that honor instead going to Morry Hollowell who does an admirable job of creating the right atmosphere for this issue. In general, the art of Daredevil has been one of the title’s great strengths for a very long time, and that trend continues here. As an epilogue to an event that has left fans divided, to say the least, After the Fall does a very good job of bridging the divide between Shadowland and what we can expect from Daredevil: Reborn, both in terms of tone and content. Two big thumbs up to everyone involved with this issue. Sounds like a solid read. Sadly this only reinforces another comment I had on an earlier topic here, and that is that Johnston has been the main positive force on Daredevil over the last year. Diggle’s solo issues of Daredevil were drawn out and borderline pointless. Shadowland, I certainly didn’t like. All the issues Johnston co-wrote were great though. Even the Shadowland issues of Daredevil were mostly solid, just tied to a horrible story. Everybody seems to be holding out hope for Reborn, but that is all Diggle. Not to be mister negative but I hope Mr. Diggle pulls it together for his last story. Another thing, I really hope Detective Gordon, oh I mean “Kurtz” disappears from the book when Diggle leaves. Brubaker gave him a good voice and Diggle has also for the most part, but does he need to be drawn exactly like Jim Gordon? Show a pic of him from Diggle’s run to anyone who reads comics but doesn’t read DD and I guarantee 99 out of 100 would swear its Gordon. I really liked this issue, and I would be more than happy to have this creative team take over an eventual Daredevil relaunch. Have anybody else noticed that Kurtz’ raincoat is always blown by wind, even in closed rooms? I suspect he’s been copy-pasted from another vignette. I think Shadowland sucked, Diggle’s writing sucked, the whole end of the Man without Fear was a debacle. I am not reading Reborn, I quit. I am so disgusted.